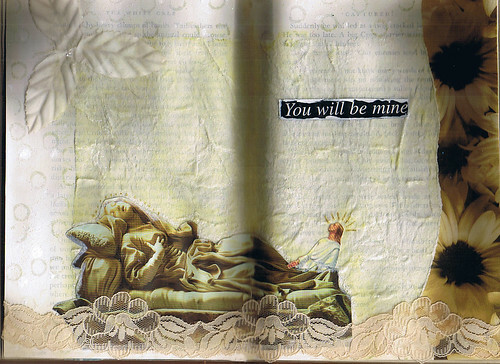 Here are the first two spreads in my new colour-themed altered book. This one is White. 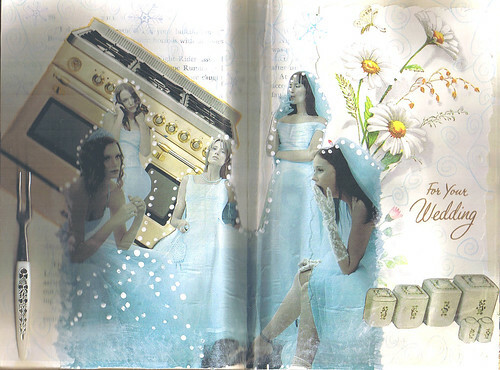 The emphasis will be on white and white will be the main colour of each spread. But as soon as I sat down to work I knew other colours would have to be incorporated too. Pure white pages wouldn't allow me to doodle, outline, paint and that wouldn't be any fun! Two totally different spreads here, one serious and one humourous. If you click on this to see it in the largest size you will just be able to see the glitter in the background. I painted glitter snow over the background when it was finished. I don't know why I don't use that stuff more often. It's a perfect, non-messy way to add a bit of sparkle. The texture in the background is a used dryer sheet and I've had the vintage lace for a long time and never used it before. This image is from a german magazine so I have no idea what it was all about but I just love this image. Can't you tell just how excited they are thinking about their new role as "wife"?